I'm a bespoke women's clothing designer, Japanese by birth and now living in London. I graduated from the London College of Fashion (part of the University of the Arts London) in 2002 and worked at a high-quality women's boutique in central London for over four years. I have been working independently since March 2008. I mainly make wedding dresses, bridesmaid dresses, and wedding veils. Since I have been making wedding dresses, some brides have asked me how to make a wedding veil, so I decided to write this blog. One of my grandmothers was a kimono tailor, and my other grandmother would weave kimono fabric in the garage during the winter when she was not busy doing farm work. When I was a little child, I always played with the fabrics cuttings, making towers with thread bobbins and organising the sewing box. I started to make small dolls when I was 6 years old, going on to make simple clothes later, so I really like to use my hands and create something all the time. When I got married, I made my wedding dress and veil by myself. It was a great experience and I was so happy during that process. 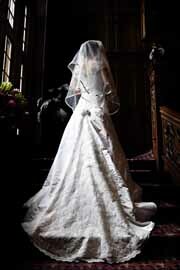 I hope you enjoy my blog site and make a wonderful wedding veil. If you have any questions, can you contact "info@makeaveil.co.uk" please. Please visit "http://katsuko.net", if you are interested in a bespoke dress.